The fourth winery to be opened here in the Walla Walla Valley was Seven Hills. Casey and Vicky McClellan had already been partners in a vineyard on the Oregon side, and began winemaking a few years later. Finding themselves a bit stranded – an Oregon winery at a time when there was virtually no eastern Oregon wine industry to speak of – they moved to the historic Whitehouse-Crawford building in downtown Walla Walla, where they have comfortably resided since 2000. 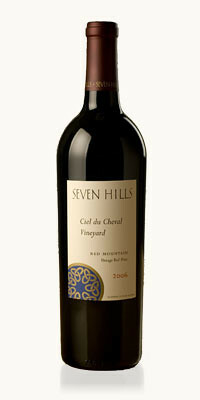 The Seven Hills style has been one I have always admired, for its consistency, its elegance, its longevity, and focus. I have often written that this was one of the most reliable values among all Washington wineries, and it is more true today than ever before. Tasting through almost a dozen new releases, I quickly concluded that these 2009 red wines are the best wines – individually and collectively – that Casey has ever made. Time will prove me right or wrong, but I believe that they will also age beautifully. Full notes and scores will appear in a future issue of Wine Enthusiast, but here is a pretty good overview. All these wines are highly recommended; I list them in order of my personal preferences. A masterpiece of blending, this has myriad pinpoint details, from the nose of flowers and berries, to the mouth-filling mélange of red and black fruits, and highlights of pepper and Asian spices. Roses, blackberries, cassis and baking spices are beautifully rendered in a wine rich in depth and detail. More bottle age will surely bring still more complexity and soften some astringent tannins. Soft and supple, focused and detailed, it’s a riot of pastry-fruited berries and cherries, with a concentrated mid-palate bursting with full-bodied flavor. It moves into a lengthy finish with toast, tobacco, coconut and caramel highlights. Skillfully made, blended with 9% Cabernet Franc, all estate-grown, this long and lovely Merlot captivates with sophisticated, elegant styling. The Franc brings some floral highlights to the nose; while the sturdy Merlot, dressed in accents of incense and sandalwood, cocoa and cinnamon, powers its way through a marvelously long finish. Pure, almost crystalline in its expression of fruit, this 100% Malbec captures the essence of mountain berries. Juicy, young and perfectly balanced, it suggests a range of notes from tangerine to blueberry to wild raspberries. This is unusually smooth and silky for Petit Verdot – 100% varietal, with the floral aromas of the grape matched to deep flavors of cassis and smoky espresso. The tannin management is spot on. Five Bordeaux grapes are in the blend here, from vineyards scattered across the Wahluke Slope, Yakima Valley, and Walla Walla Valley AVAs. Buttery and round, with a fair streak of vanilla, this sports plump black cherry and raspberry preserves, polished tannins and highlights of fresh cut tobacco. A super value, the 2009 Planing Mill Red is an eight-grape blend that nonetheless shows lovely integration of fruit, subtle aromatics, and a seamless progression of well-balanced flavors. Cherry, chocolate, and buttered toast come into play, all done in an elegant and most appealing fashion. I couldn't agree more. Seven Hills is one of the most admirable wineries in Washington. Casey has a clear vision and an easy-to-spot house style, and he has stuck with it despite the vagaries of wine fashion. These wines have a consistent track record of aging beautifully, as well; rare wines in the $20s and $30s that you can happily hold for 15+ years. Well said, indeed. It is clear that Paul's artistry with the written word and musical prowess are exceeded only by his taste and appreciation for exceptionally good wines. Your words have inspired me to start Happy Hour a little bit earlier today. After all, it is Balloon Stampede weekend! Thanks Jet, and Happy Happy Hour to you! Columbia Valley fruit. Casey's craftmanship over the years goes far in establishing distinct terroir profiles that elevate the reputation of the Walla Walla AVA and the region.